It really is difficult to believe that yet another year is drawing to a close. Some days we’re convinced the farm has slipped into a time vortex. One minute it’s February, we blink, and we’ve been instantly transported to the end of December. Unfortunately, we have yet to figure out how to make this time vortex work in reverse. The laws of physics, and space-time, simply don’t apply on the farm any more. Part of the reason for this year’s time-slip is that, even though the gardens were left fallow due to our endless drought, we had more than enough to keep us occupied elsewhere on, and off, the farm. That’s why blogging has been scarce this year. If we’re honest, we had so much going on this year, that we’re not sure we would have had much time for a garden, even if we’d planted one. If our recent rains persist though, we’re hoping to revamp our neglected kitchen garden in the spring, and maybe squeeze in a few more blog posts, too. In the meantime it’s fair to say that the farm is now very much centered around the goats. Of course. Every day, rain (thank goodness we’ve finally had some REAL rain), or shine, every single day is significantly preoccupied with all…things…goat. It seems like just yesterday that Lotus and Minnie moved into their brand new barn. Now the barn no longer belongs to just the two of them. A few short years later, and (perhaps somewhat to Minnie’s chagrin) there are so many new faces in the Curbstone Valley herd. 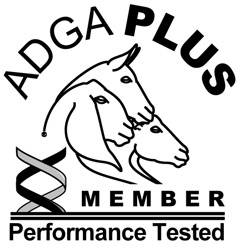 Thanks to Darby, Magnum, and Zedo…there are many more new faces on the way! I’m all but certain that the entire neighborhood now only seems to know me as the ‘goat lady’…hopefully sans the ‘crazy’ part, but maybe that’s too much to hope for. Our small herd is always on the list of things to see for visiting friends, family, and neighbors, and we seem to have become the local neighborhood attraction. So much so, that sometimes I wonder if anyone notices me at all, but can you blame them? Everyone that meets the goats is entirely enamoured with them, and so are we. Despite hectic spring kidding seasons, milking each doe twice a day, every day, in all weather, the drive-all-over-the-place pack-the-truck-unpack-the-truck craziness of show season, and the be-prepared-to-drop-everything-to arrange-a-date unpredictability of breeding season, I wouldn’t trade any of it for the world. I used to sit in an office, day in, day out, wearing a suit, and high heels. You couldn’t drag me back to that life, though, for all the stock options, and matching 401(k)’s in the world. This office is much more fun than an office in the City! However, I have to admit, that at the moment I’m grateful the year is drawing to a close. After running full steam ahead all year, this is the time of year where we can finally catch our breath, at least a little, before the kids start hitting the straw again in February. We finally have a few weeks to catch up on other important farm projects before the predictable sleepless nights, endless hours of bottle feeding babies, and the inevitable myriad of distractions that spring will bring, that lie ahead. So, while we pause, recharge, and plan our new year ahead, we hope that you can also find some time to do the same. We’d like to thank all of our friends, family, neighbors, and especially our customers, for all their support this year. We appreciate each and every one of you, and we are greatly looking forward to seeing what the year ahead will bring for the farm. In the meantime, we wish you, whether near or far, all the peace, love, and joy of the holiday season, and throughout the coming New Year! Clare it is delightful to see the goats growing and so many more added to your family…I can’t believe it has all happened so fast…and glad you have rain. Wishing you and the whole big family a very Merry Christmas! Enjoy the rest…. Thank you, Donna! I’m looking forward to recharging my batteries a little. It’s looking like this next spring will be even busier than the last! Merry Christmas!!! We love having you here too, Clare! 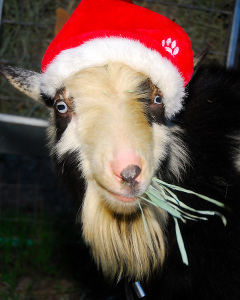 I loved the site and can’t wait to show the goats in Xmas dress to the girls. Best wishes for a wonderful New Year. Happy New Year, Sheila! Be sure to bring the girls by this spring! Happy New Year, Town Mouse! Hope we can see you again this spring. I’m with you, and wishing for more rain! Aw, they are just so cute! You definitely sound like you’ve been busy! And more goats on the way, hurrah! So glad to hear you guys finally got some much needed rain. I hope the next year brings an end to the drought for you! Happy New Year’s! Unfortunately, we’re so far behind on rainfall that will take at least a couple of seasons to officially end the drought, but we’ll take every drop we can get. We’re encouraged that we’ve had much more normal winter weather so far this season. We’ll see if that holds! Happy New Year, Clare! Thanks for sharing the year-end update of your adorable goats.